Ever bored of the same old same old breakfast porridge? Yeah me too. Me too. Which is why I have decided to mix it up a little with this Creamy Tahini Porridge. This is a sponsored conversation written by me on behalf of a2 Milk™. However, all opinions are my own. Nothing against my breakfast porridge with roasted blood oranges or my almond butter mango overnight oats. 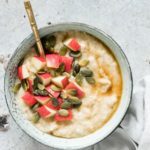 I still eat them and will continue to do so till kingdom come, but there are days when I just really need something that little bit different – hence this Tahini Porridge. Know what I mean? 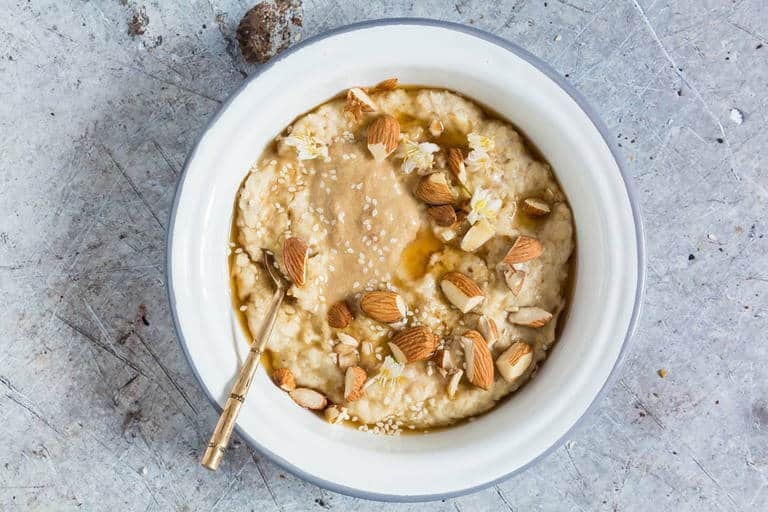 So enter this rather awesome (I am still at it with the smug back-patting) 5-minute tahini oatmeal that is different but so quick and easy to make using pantry staples: porridge oats, honey and tahini. Tip: If you don’t have tahini then feel free to use peanut butter or your favourite nut butter instead. Tips On How To Get A Smooth Tahini Porridge. If you are cooking it in the microwave take it out halfway through cooking and mix it well for the tahini to blend in, before continuing cooking. You could also loosen the tahini in a little bit of warm milk before adding to the oats. If making on a cooker then you might want to stir continuously when the milk gets warm. So, I developed this Tahini Porridge for my sister. Because I am nice like that. She loves treating herself to a huuuuuuuuge bowl warm comforting breakfast porridge but has avoided this for a while as she struggles with digesting normal milk. Luckily, we discovered a2 Milk – aka easier to digest milk that has only the a2 protein, not the a1 protein that has been discovered to cause bloating and all sort of digestive protein in people. This has changed her life and she now has a mission to drink milk in the gallons rather than her previous mission to avoid it at all costs. Oh peeps, she is so, so happy. And you know that extra honey and tahini I kind of drizzled over the top of the porridge. Well you don’t quite need it as the porridge is already well flavoured with tahini, and in a very good way. But peeps, do go the whole way and add that extra helping or two, as well as some roughly chopped almonds as this then makes the flavours pop and your mouth, brain, belly and everything else will thank you. I promise. 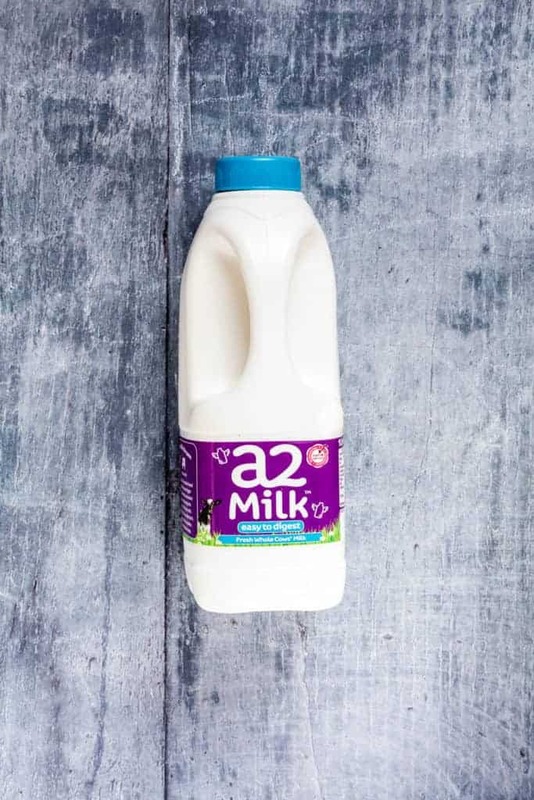 Please do head over to the a2 milk website, where you can find lots of information about allergies and intolerances and even a contact email for their own in-house nutritionist. You can also find them on Twitter or Facebook for more information. *a2 Milk is not suitable for anyone medically diagnosed with galactosaemia, lactose intolerance or a cows’ milk allergy. If you require any specific advice, then please do check with a nutritionist. Thank you for reading my Tahini Porridge recipe post. 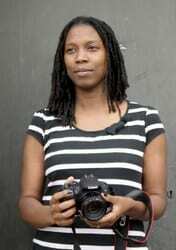 And please come visit again as I continue dreaming up recipes, traditional African recipes, African fusion recipes, Sierra Leone recipes, travel plans and much more for you. 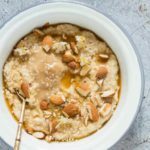 Here is how to make Tahini Oatmeal. Please do try it and if you do make it then please do tag #recipesfromapantry on Instagram or Twitter so that I can pop over and have a look. It is really, really awesome for me when you make any one of my recipes. You can also share it on my Facebook page. Don't forget to tag #recipesfromapantry on Instagram or Twitter if you try Tahini Porridge! It is really, really awesome for me when you make one of my recipes and I'd love to see it. You can also share it on my Facebook page. Please pin this recipe to Pinterest too! Thank you for reading Recipes from a Pantry. Put the porridge oats, milk and tahini in the saucepan over medium heat and mix well. Bring porridge to the boil and reduce to a simmer for 5 - 6 mins stirring regularly till the porridge is cooked and creamy. 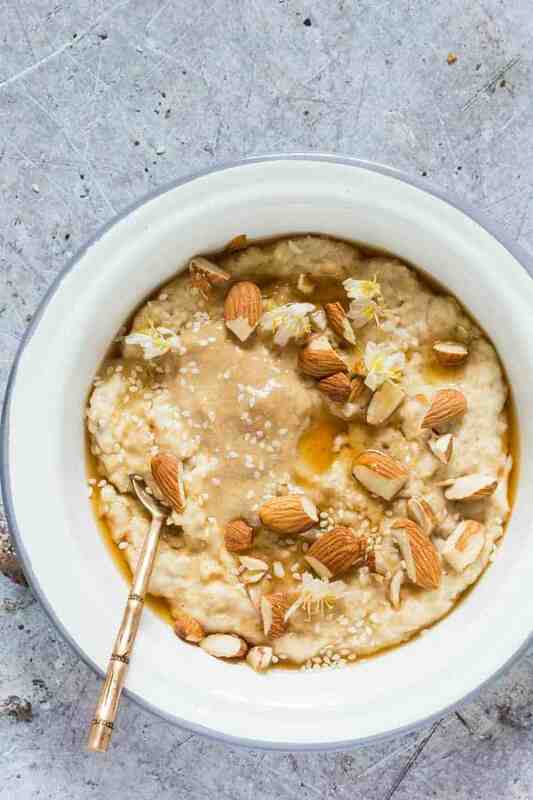 Ladle porridge into bowls and top with the almond, honey and extra tahini. If you don’t have tahini then feel free to use peanut butter or your favourite nut butters instead. 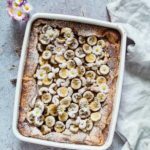 Great twist on a normal porridge recipe. The mango and almond butter oats sounds amazing too! I eat porridge every single day, so I totally understand how the same recipes can get a bit boring. I’ve never thought about mixing in some tahini. Definitely going to try this! I love porridge for breakfast. It’s nutritious and soooo healthy. Same as you I’m always looking for new ways to prepare porridge in new interesting ways. This tahini porridge looks and sounds delicious. I can’t wait to try this! 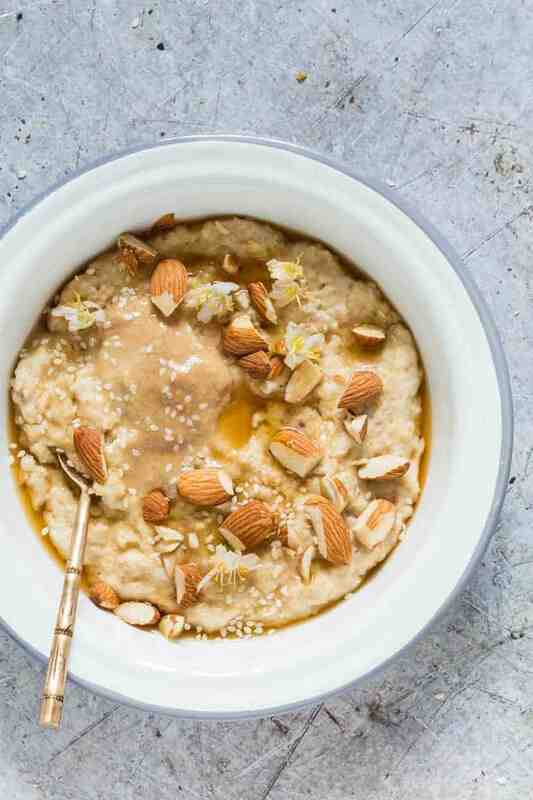 This porridge does look incredibly creamy – looks so delicious! I love the idea of a savory breakfast! Sometimes I put mushrooms and spinach in my oats just to mix it up, this is along the same lines. 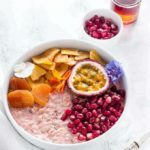 I have porridge everyday for breakfast and I’m always looking for ways to add a little twist. This looks interesting. Will have to try soon. the tahini adds a wonderful nuttiness to this breakfast. What a great flavor combination, I have to try it and I am very interested in the A2 milk! Yep, sold, can’t wait to try this one. I only just discovered tahini the other week (I know, where have I been???) and I’ve fallen in love. To me, it tastes just like peanut butter but without all the sugar and guilt. Now I’ve never experimented with nutty tasting oatmeal before either so it’s time to rectify that like right now! One of my favorite things for breakfast! Hot cereal with tahini mixed in! I’m all about savory breakfasts, and I adore tahini. What a lovely bowl combining the two! Delicious, Bintu! 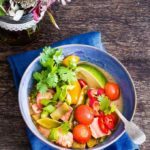 I can definitely see myself starting the day off with this amazing recipe!